Larval masks are a type of training mask essential to the Lecoq pedagogy. They allow the performer to begin exploring how they can use their body to open up theatrical territories on stage. 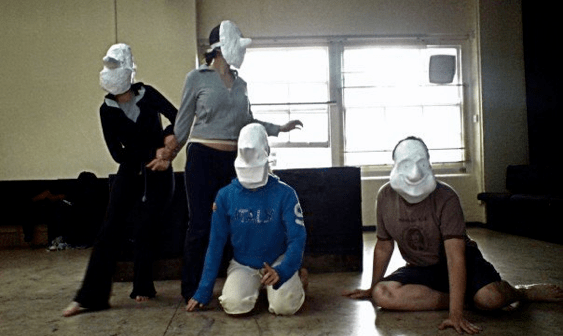 Participants will learn about the origins of the mask, and how it can be used to free a performer’s body as well as teaching important lessons about staging, movement and the importance of stillness. The workshop will begin with a physical warm-up aimed at freeing the class of tension and inhibitions before beginning to examine and work with the masks. Working in small groups, students will encourage and direct peers in mask in order to develop physical and mask skills using gesture and movement. The workshop will include either physical choral work or the devising of a short mask scene. Group size must be a minimum of 8 students and a maximum of 30.